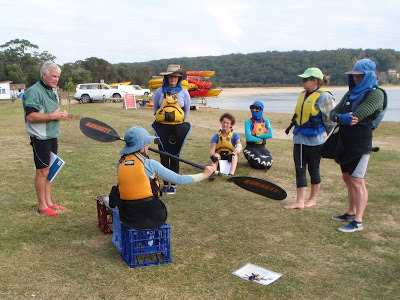 The Balanced Boater: NSWSKC at the Royal National Park. The lure of a paddle along the cliffs to Little Marley was only part of the reason we assembled at Bonnie Vale last Sunday. For Adrian it was a chance to practice his instructing skills and pick up a few tricks of the trade. For some of the group it was a last minute practice before upcoming sea skills assessments. For Cathy, a first paddle on the sea. And for everyone a chance to apply their skills to the open waters of the "Royal Coast". We kicked off the day with a paddling workshop. Sharon showed us how to do it and Adrian added a detailed commentary before we headed off ,eager to put theory into practice. 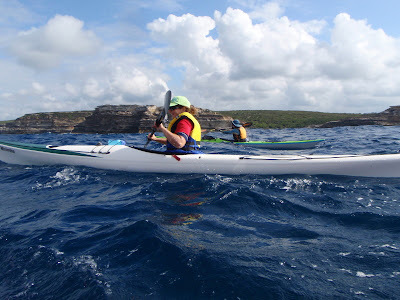 We offered corrections on posture, hand position and general fwd technique before leaving the shelter of Port Hacking. Once we turned the corner at Jibbon Point it became abvious that everyone would get to test the efficiency of their stroke punching into the steady 8-12knot headwind. 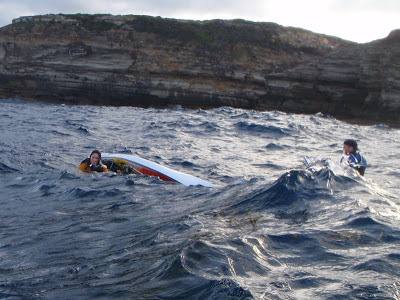 I also realised some towing practice would be necessary if we were to get to Little Marley for lunch. Above you can see the adventurous Cathie on her first paddle on the sea. She chose a good day with just enough wave action to "keep it real"
We land at 1.00pm due to the headwinds and a leisurely start. An easy landing and smiles all round with the promise of lunch in the sun. 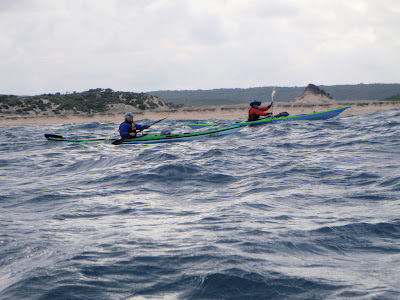 (above) After lunch, Adrian and Sharon paddling past the disinctive peaked dune that rises out of the Lagoon behind Big Marley. Ian is holding station nearby just in case she needs help. Success! 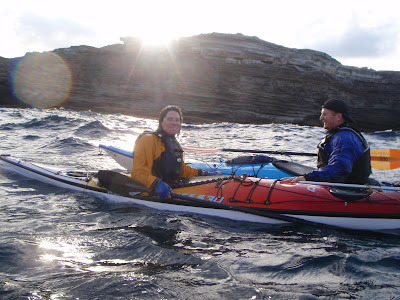 Jan rolls and Ian rafts up while she attaches the spray deck and has a break. 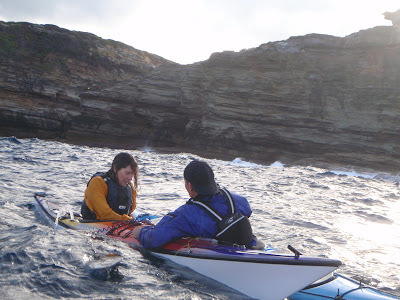 With the sun about to dissappear behind the cliffs we decide everyone is wet enough and tired enough to head back to the calmer, busier waters of the bay. 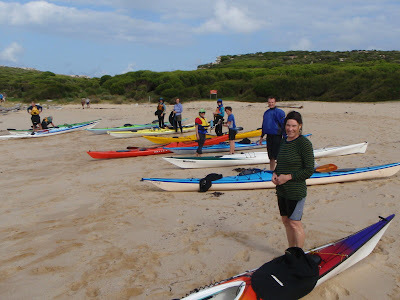 Thanks to all who paddled for working as a team to make this a safe and friendly day and to Sharon and Adrian for Sharing their skills and knowledge.